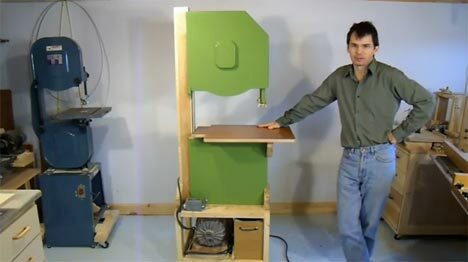 Our favorite woodworking DIY gadgeteer Matthias Wandel is at it again. The last time we wrote about Matthias, he was showing off his DIY precision tenon cutting jig for the table saw. Today we talk about his homemade 18-inch bandsaw. Yes, he built an entire bandsaw from scratch. For the most part the bandsaw is made out of either solid wood or plywood, including the wheels which he turned himself. His saw may be DIY, but it sure doesn't look like it and has all the features one would expect a bandsaw to have. Matthias has a ton of photos and details on the build of the saw on his website, but for the lazy, check out the videos after the Read More.